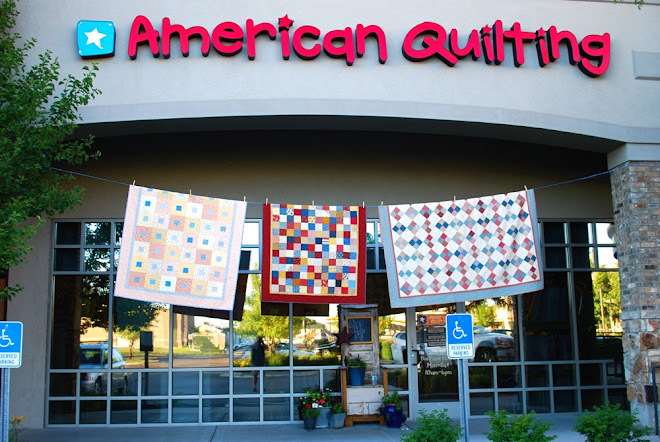 AmericanQuilting: Some of our available quilt kits! A few new quilts with kits to share! This is called A Boy's Life and is made of rich, high-quality flannels. Kit is available for $80 and requires the wonderful pattern book, A Boy's World. A new baby quilt called "He's All Boy" because of the many cute 'boy-themed' prints. We used a lot of prints from David Walkers Oh Boy collection for Free Spirit Fabrics including dinosaurs, animals, airplanes, robots, and space ships. This kit includes 36 pre-cut squares, fabric for borders and binding and includes a pattern. The back requires 1 1/4 yard. We used this adorable animal print from the Oh Boy collection. It is made from brown and pink civil war reproduction prints. All squares are pre-cut and the quilt is pre-stacked in rows so no pattern is required. Borders and binding are also precut. The quilt measures 58" x 82". The kit for the top costs $89.00. Back requires 3 1/2 yards. Another simple squares quilt called Mary Helen. Beautiful muted greens, browns and pinks, most from the fabric collection Stone Cottage by Andover Fabrics. This quilt is also pre-cut and pre-stacked by rows. Finished quilt measures 58" x 82" and the kit costs $89.00. Yardage required for back is 3 1/2 yards. Vintage Homestead is now 30% off! Quilt measures 51" x 63"
and pattern is included. If you are interested in ordering any kits or yardage please call us at 801-802-7841! Are the kits including Vintage Homestead quilt kit only available for participants in the quilt retreat?